It is hard to believe that on Wednesday the kids will have been in school for SIX weeks! Where does the time go?!?!?!?!?!?!?!?! I was really hoping that with both boys being in school all day that things would settle down and I’d be able to get some things done. Oh, no!!!!!!!!!!!!!!!! Things have been absolutely CRAZY busy!!!!!!!! Since I haven’t updated on the boys for a while, I guess that’s where we need to start. At the end of last school year, we were preparing for the boys to head to their summer camp. Caleb was excited to go; however, he struggled through the camp this year. We’re not exactly sure why, especially since Caleb can’t tell us. There’s some things that are happening that we can’t go into on a public blog, but we have decided that that was the last year for the boys to attend the camp. We have already talked to his teacher and it appears that we will be more than likely changing his IEP to add in Extended School Year and then I will be planning some fun activities and day trips for the boys and Caleb’s worker(s) to keep us all busy and from going stir crazy! August 10th was the first day of school this year. I really dreaded this coming school year since it was such a big transition. We were transition from middle school to high school. However, because of the problems Caleb had transition from elementary school to middle school, everyone went over and beyond to try and make this transition as smooth as possible for Caleb. I was quite impressed. The first couple of weeks went really well, as Caleb had his para from middle school there, whom he absolutely adored. However, once she started backing off and started allowing the high school paras to take over more and more responsibility, Caleb’s anxiety heightened more and more and they began to see more and more behaviors. Thankfully, they understand that this is Caleb’s disability and I have NOT had to go and pick Caleb up due to his behaviors. Now, he has had a number of restraints/seclusions, of which it breaks my heart, but I understand they have to keep him and everyone else safe. We have already had an amendment IEP meeting, which the teacher asked for. Caleb now has two paras for most of the day. The only time that he does not need two paras is when he is in PE class, which he absolutely loves. During PE class he will only have PE class. I can’t say enough about the school and how much they are trying to make this work for everyone! The end of August Caleb and I went up to Kansas City to see his orthopedic surgeon. He is 14 months out from his leg surgery where they put in the plates and screws to straighten the bowing of his legs. After his x-rays, we found out that his right leg is straightening much faster than the left leg. His doctor believes that when we go back in February we will be scheduling surgery to remove that plate, but will have to continue watching the left leg. As you can see in the picture, his right leg is much straighter!!!! Steven continues to be a bundle of energy! He seems to never slow down or want to slow down! He can be literally exhausted and he refuses to slow down until he absolutely just lays on his bed and falls asleep! He still continues to amaze us every day how blessed we are with how far he has come. This year Steven also had a big transition from half-day kindergarten to all-day first grade! He is even taking his lunch to school every day!!!!! We have conferences next week and I’m anxious to talk to his teachers (regular ed and special ed) to see how he’s doing in the classroom. I know there’s been a couple issues in the lunch room; however, he is in sensory overload in the lunchroom and they’re working on that. He does a have a para all day, including lunch now that he’s been struggling so much in the lunch room. We always knew I drove a lot during the summer, but never kept track of the miles. Having a brand new car this year made it easy to keep track of the miles that I drove over the summer. From the time we got the Equinox until the the day school started (which did include our vacation and one trip to Topeka), we put the following amount of miles on the vehicle in less than 10 weeks. 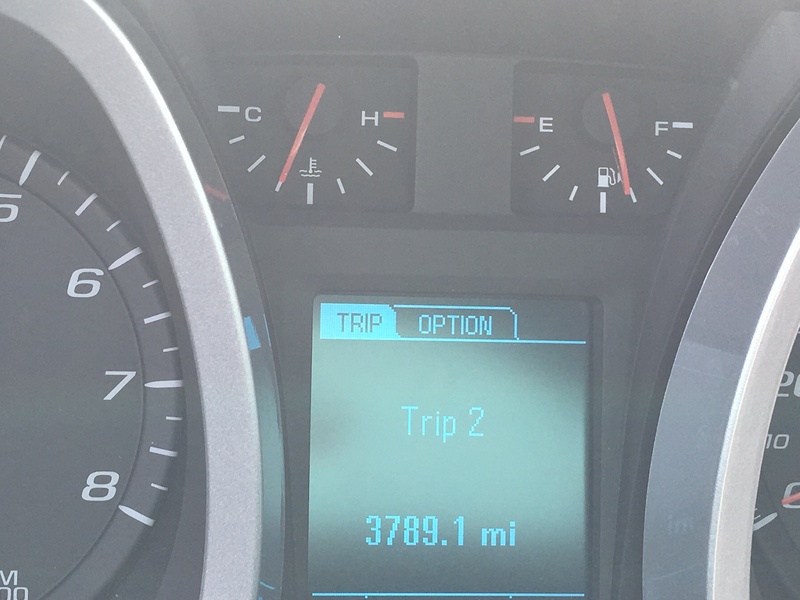 Most of those miles were just taking/picking up the boys from camp! I am always grateful for our bus drivers by the end of summer!!!!!! !